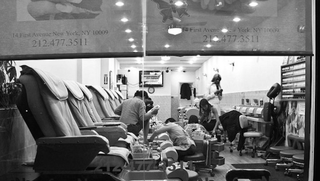 The New York Times has spent the better part of a year conducting a fairly groundbreaking investigation of labor conditions for nail salon workers, and the first installment in their “Unvarnished” series is clear, chilling, and heartbreaking to the last word. Reporter Sarah Maslin Nir starts with a scene of young immigrant women standing on a street corner in Queens, ready to be picked up in vans and dropped off at salons where the beginners among them will have to pay salon owners for the privilege of doing manicures—waiting months, usually, before meriting their eventual starting wage, which amounts to tips plus a rough average of $10-30 per day. The piece is notable for the language hoops its reporters had to jump through—they interviewed more than 150 salon owners and workers, with translators in four languages, carefully navigating the scared, often-undocumented status of the latter category that has made the rampant, typical, customary nail salon rights violations so easy to overlook by the New York Labor Department (which just did its first nail salon sweep last year). “The Price of Nice Nails,” crucially, also comes with three translation options up top—for Chinese, Korean and Spanish. Part of the problem in New York City specifically is that there are so many salons; LA and San Francisco, the cities that come the closest in terms of salons per capita, have about half the saturation that NYC does. Related to this is the fact that manicures are cheap as hell in NYC—cheaper here than almost anywhere, despite the cost of living being so high. This is an essential read, and even if you don’t get your nails done in salons, it’s exactly the type of local, female-dominated labor issue that New York City women should be motivated to organize around. The whole thing is here (and Vice interviewed Sarah Maslin Nir, the reporter, if you’re interested in how the story came together). And, although our informal NYC surveys suggest a 20 percent tip rate is okay, maybe this article will spur manicure-getters unlikely to change their ways to at least do way more next time, and the time after, and every time after that.